Reliable Sources podcast: James Fallows says America is in "better shape than most other countries"
James Fallows: America is in "better shape than most other countries"
James Fallows is no doctor, but his prognosis on America is rosy. 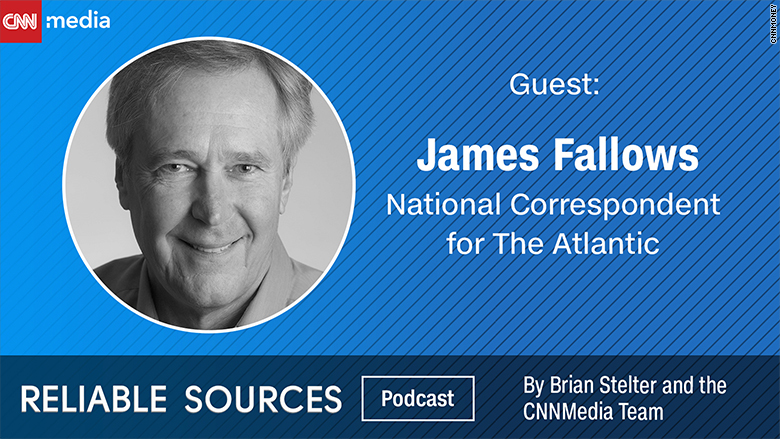 "The country as a whole, fundamentally, is in better shape than most other countries," Fallows told Brian Stelter in this week's Reliable Sources podcast. Fallows, a national correspondent for The Atlantic, knows from first-hand experience. He has spent the past four years piloting his propeller airplane with his wife and traveling to more than two dozen cities in the United States. They are now working on a book chronicling their adventures, to be published next year. "The gimmick is that we are going to places that have smaller airports, but no other forms of connection." Their travels took them to Sioux Falls, to Central Oregon, to Fresno, and to Fallows' own hometown of Redlands, California. Fallows told Stelter that by traveling across America, he learned that notwithstanding known issues such as the opioid epidemic and growing economic dislocation, "people in most parts of the country feel as if they are moving forward, rather than backwards." "America is a basically functioning country with a non-functioning national political system," Fallows said. The toxicity of American national politics concerns Fallows. With the two parties presenting two dramatically opposed worldviews, even asking people about their preference between Clinton and Trump can spark "irreconcilable religious feuds." That conflict was on full display during President Trump's latest rally in Phoenix, Arizona, where he doubled down on his attacks against the press by calling journalists "sick," "bad people," unpatriotic people who wish for America to fail. "No president has said things like that in public before," said Fallows. Even President Nixon, who was not a fan of journalists, "paid some lip service to the idea that there was a civic function in criticism from the press" back in his day, Fallows observed. The rally was the inspiration behind Fallows' Wednesday column. In it, he called out the GOP for "looking the other way as [Trump] debases his office and divides his country." The "nakedness" of Trump's attack on the press is worrisome to Fallows. He believes that Trump has failed to understand that "an American president, every second of the day, with everything he says, is representing the weight of the office." Fallows thinks that concern alone is reason enough to question Trump's fitness for office without having to assess his mental health, something that only trained medical professionals can do. "It doesn't matter if we give a specific medical name to whatever it is that Donald Trump is doing," Fallows told Stelter. "Just the fact that he does things that we don't think of as normal, sober practices, for somebody who is the most powerful person on Earth" raises questions about his ability to lead the country. If America has "a real challenge" to its national system right now "in the form of Donald Trump," Fallows is hopeful about the resilience of the "American organism" as a whole, since the judicial system and the press are still upholding their standards. Stelter and Fallows tapped into this and many more topics, including a discussion on the best craft beers in the United States. Listen to the full podcast here and subscribe on iTunes here.